Target 1 face-up card on the field that you can place a Spell Counter on; place 1 Spell Counter on that target, then you can add 1 "Spell Power Grasp" from your Deck to your hand. You can only activate 1 "Spell Power Grasp" per turn. Gather Your Mind is a weaker version of this card. However, this card can only be played when a Spell Counter card is active. Under these conditions, Toon Table of Contents is usually better in the mind of Deck Thinning. Endymion, the Master Magician appears on this card's artwork. The effect of "Spell Power Grasp" targets the card which will gain a Spell Counter. : Spell Card > Spell Power Grasp: Does the effect of "Spell Power Grasp" target? You select the card when you activate "Spell Power Grasp". You can activate this card when there is no copy of "Spell Power Grasp" in your Deck. 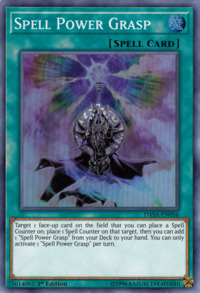 Even though only one "Spell Power Grasp" can be activated per turn, you can chain "Serial Spell" to "Spell Power Grasp". Both will resolve properly, so you place a Spell Counter and add a copy of "Spell Power Grasp to your hand, and then place another Spell Counter and add another copy of "Spell Power Grasp to your hand. : Can "Serial Spell" be chained to "Spell Power Grasp" which you can only activate one per turn? If the activation of "Spell Power Grasp" is negated by "Magic Jammer" etc, then another "Spell Power Grasp" can be activated. : When the activation of "Spell Power Grasp" is negated by "Magic Jammer", can another one be activated? If the monster targeted by "Spell Power Grasp" is not face-up on the field at resolution, then do not place a Spell Counter, and you cannot add a "Spell Power Grasp" from your Deck to your hand. : Can you still add a "Spell Power Grasp" from your Deck to your hand when the effect of "Spell Power Grasp" cannot place a Spell Counter?